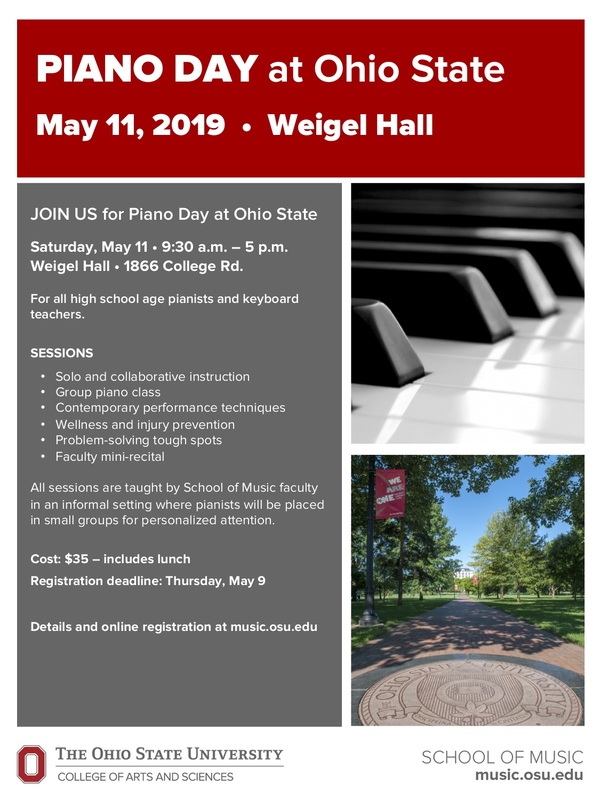 The Ohio State School of Music is pleased to sponsor its Third Annual Piano Day on Saturday, May 11 from 9:30 a.m. – 5 p.m. for all high school age pianists. Keyboard teachers are also welcome to attend. 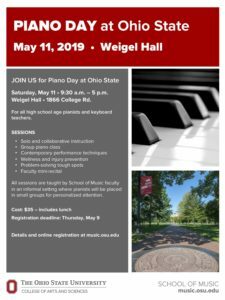 The day-long workshop is designed to engage pianists in a variety of topics that includes solo and collaborative instruction, group piano class, contemporary performance techniques (using the mechanics of the piano), and wellness and injury prevention. All sessions are taught by School of Music faculty in an informal setting where pianists will be placed in small groups for personalized attention. The day will conclude with a mini-recital presented by the faculty. Please share the attached flyer with your high school students and share on Facebook. We look forward to seeing you on May 11.